Enjoying making paper flowers as here in Maine we still have lots of snow on the ground and more to come – we won’t see anything growing outside for a while. Today I have another card using a couple of Susan’s new releases you are going to love them. What fun this new release is. Step 1 For 6″ X 6″ card base from white Soft Finish Cardstock. 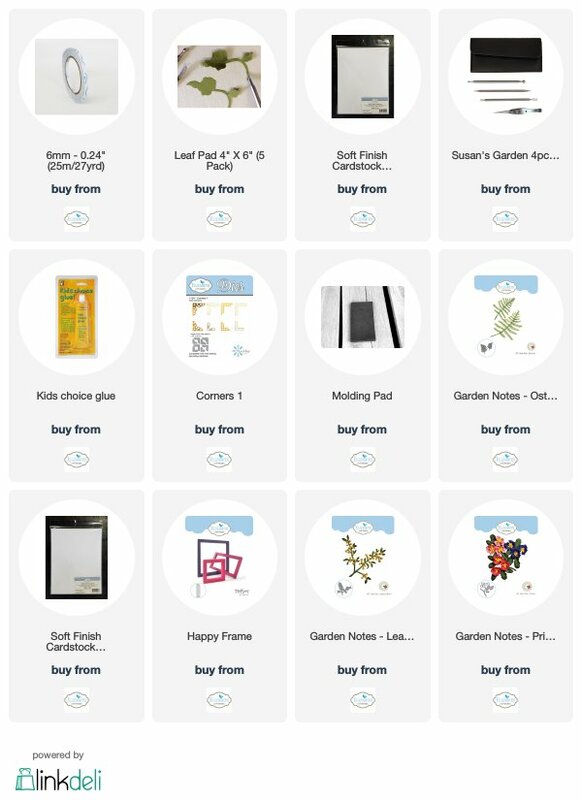 Step 2 Create 6″ X 6″ ModaScrap Happy Frame from white Soft Finish Cardstock. Step 3 Cut patterned paper 5-3/4″ square adhere to card front using Clear Double Sided Adhesive. Adhere frame to card front using Clear Double Sided Adhesive. Step 4 Cut 2 Garden Notes Bushel Baskets from brown cardstock which has Clear Double Sided Adhesive on back. Adhere 1 on top of other. Using Distress Ink shade basket. Remove protective paper from back add couple pop dots to center back adhere to card front. Step 5 Using Garden Notes Fuchsia die set cut 10-12 flowers from white Soft Finish Cardstock and leaves and stems from green cardstock. Using alcohol markers to color flowers and distress ink to shade leaves and stems. Shape using Susan’s 4 pc All Metal Tool Kit, Molding Mat and Leaf Mat. Assemble using Kids Choice Glue. Add to basket using Kids Choice Glue. Step 6 Cut 2 ModaScrap Lace Corners from white Soft Finish Cardstock adhere to frame using Kids Choice Glue. 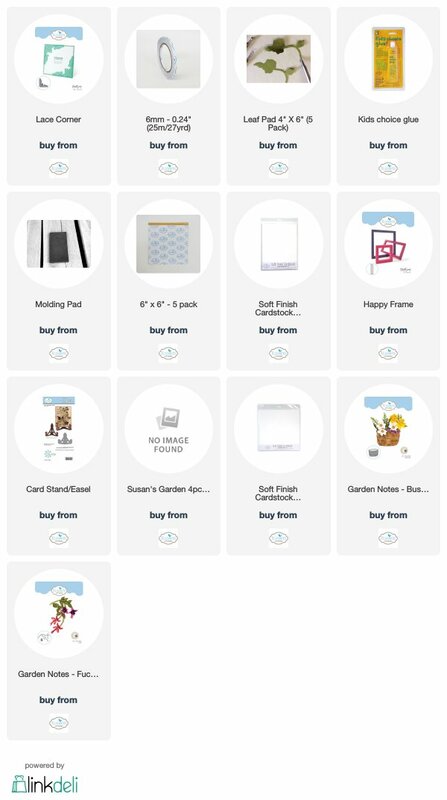 Just click on any picture of items it will take you directly to their site. I do hope you have enjoyed my card today and will make your own cards thanks for stopping by. So until next time – Happy Crafting! Once again it is time for another Elizabeth Craft Designs Design Team Challenge and this month our challenge is “Frame It”. For this challenge I have chosen one of the new frames by ModaScrap – Happy Frame along with a couple of Susan’s Garden new releases Primrose 1 and Leafy Berry Branch. For today’s challenge Elizabeth Craft Designs are giving away a $20 Gift Card to use on our website to 3 winners. The winners will be announced on Friday, March 23rd on the Elizabeth Craft Designs blog. Step 1 Cut 2 Leafy Berry Branches from green cardstock. Add berries using Nuvou Crystal Drops (Rhubarb Crumble used here) set aside to dry. Wile cutting from green cardstock cut set of Garden Notes Ostrich Fern. Step 3 From 100# white Soft Finish Cardstock using ModaScrap Happy Frame cut 4 times. Trim 2 pieces to 5-1/4″ (trimming from straight end) trim 2 pieces to 3-7/8″ build frame. Els just did a Technique Friday video on making Happy Frame XL it can be found here. Step 4 Using Clear Double Sided Adhesive attach frame over background piece. Step 5 Card base cut black cardstock 3-7/8″ x 10-1/2″ score at 5-1/4″ fold on score line. Attach frame and background piece to card front using Clear Double Sided Adhesive. Step 6 Using ECD Corners 1 die set cut 4 corners from white Soft Finish Cardstock with Clear Double Sided Adhesive on back (I chose corners that had five dots which I saved and added back in) attach corners to frame. Step 7 Cut 5 Primrose 1 from white Soft Finish Cardstock (or you can cut from colored cardstock and shade) color using Copic Markers YR15 and Y38 used here. Shape using Susan’s Garden 4 pc Tool Kit and Molding Mat Susan has a video on her Facebook page Susan’s Garden Club found here. Cut several leaves from cardstock either green cardstock or white cardstock coloring with Copics Markes YG97 and G85 used here. Shape using leaf tool and leaf mat. Step 8 Attach ferns and berry branches to card front using Kids Choice Glue build your primroses onto card front using Kids Choice Glue. Step 9 Cut Happy Birthday twice once from black cardstock and once from white Soft Finish Cardstock that has Clear Double Sided Adhesive on back attach white Happy Birthday on top of Black. Attach to bottom of frame using Kids Choice Glue. Note: the die I used was an ECD Stand Up Helper Die that is no longer available which I discovered when preparing my tutorial I apologize but I did check out the new release of dies and #1465 Words 1- Celebration has a “happy birthday” die which is a bit longer but you could attach happy to the top of frame and birthday to bottom as well as #783 Happy Birthday and #1284 Happy Birthday. Hope that this tutorial is an inspiration to you to try your own design. Be sure to go to Elizabeth Craft Designs to enter to win and see what all the other design team members have created. 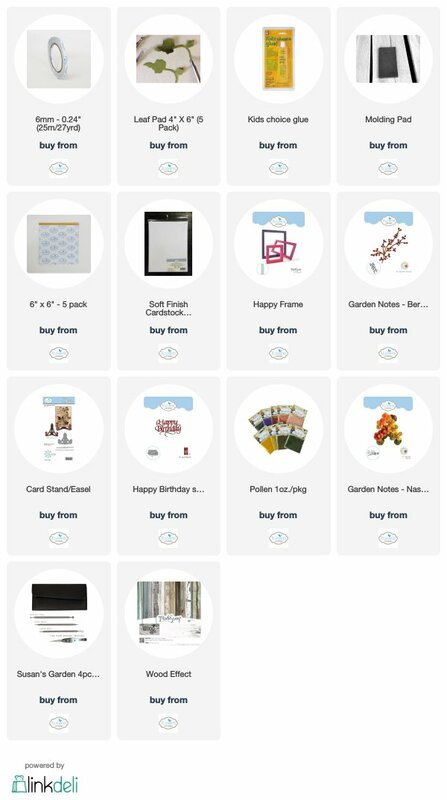 If you want to purchase any of the Elizabeth Craft Designs supplies I have used to create this card just click on any of the Elizabeth Craft Designs Product pictures below it will take you right to that item on their site. Today’s post is a card I designed focusing on Susan’s new Lilac 2 and Leafy Berry Branch dies along with ModaScrap’s new Happy Frame. They are all available now from Elizabeth Craft Designs. 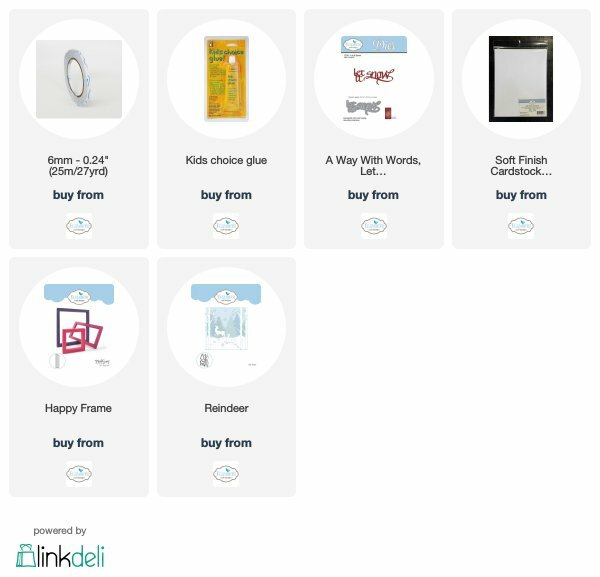 The following supplies are linked directly to website just click on any of them. 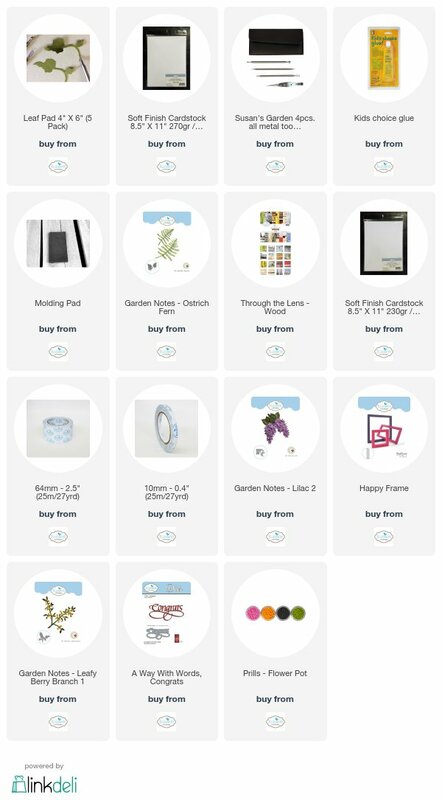 Be sure to check out Elizabeth Craft Designs blog and all the great designs our Design Team has come up with using the new releases. Thanks for stopping by I do hope you enjoyed.